Modern domestic wiring typically uses what is called "twin and earth" for most applications – sheathed line and neutral wires, plus a bare earth wire, all enclosed in an outer PVC sheath (which is usually grey or white). The line (brown or red) and neutral (blue or black) cables should not normally be visible outside of fittings such as switches or sockets (they should be protected by the outer sheath), and the bare copper line and neutral conductors inside these cables should never be exposed or accessible. Homes that were wired before 1970 will often have issues with earthing. For example, it was common to wire the lighting with a two-core cable with no earth wire – if you connect a metal light fitting to this circuit, it would not be earthed, and this presents a danger of the fitting becoming live in the event of a fault. In this situation, either the lighting circuit needs to be replaced, provided with an earth, or the metal fittings removed. In the late 1960s, in the early days of PVC wiring, sometimes the plasticiser di-isoctylphthalate was added to the PVC during manufacture, to make the cable more flexible. Unfortunately, this plasticiser can react with the copper wire over time, and then leach from the ends of the cable as a sticky green goo. As well as being unsightly, sometimes this causes the insulation to become brittle, so it is easily damaged – an insulation resistance test is needed to check if this is the case. If the insulation has deteriorated, the only practical solution is to rewire the property. The green goo is an irritant, especially to the eyes. In much older houses, rubber-insulated cables or lead-sheathed cables may be in use. The insulation on these cables may have deteriorated so much that they have become dangerous. Vulcanised India Rubber insulated cable can be a significant safety risk, as the rubber insulation perishes, cracks and falls off. Any flexing or handling of the cable is liable to expose bare conductors, making the cable very dangerous. In general, cables that are lead or rubber-sheathed may well need replacing. Even in a modern house, cables can be damaged, for example by rodents chewing off the insulation and leaving exposed live wires. This might be because the rodent is trying to use the same narrow passage as the wires, for example to get from one space to another, and tries to enlarge the passage to make life easier! Damage can also be caused by DIY work, for example by nails hit into cables in plaster walls or beneath floorboards. Any damaged cable needs to be either repaired or replaced. Another source of danger in a house of any age can be alterations made to the wiring by someone who has not understood or adhered to the wiring regulations. Common dangers found include cable sizes too small to safely carry the maximum load, cables not adequately protected against a fault by the correct fuse size or circuit breaker rating, a missing or disconnected earth at a socket or metal light fitting or metal switch, incorrect polarity (L and N swapped) at a socket, and accessible live parts such as an unenclosed connector block. A residential property should be inspected and tested at least every 10 years, and it should be clear from the results if there are problems with the wiring. As a general rule, if your home was wired before about 1970 then it might need a full or partial rewire. Miniature circuit breakers or MCBs are fitted in modern consumer units instead of fuses. They have the advantage that they can be manually reset without having to replace a fuse wire – the MCB typically has a small lever that is used to reset it. The photo shows two MCBs on the left, and an RCD (explained below) on the right. The MCB tripping is an indication either that the circuit has been overloaded or that a short circuit has occurred somewhere. Before resetting the MCB, switch off all the appliances or lights connected to the circuit, and check that once reset, the MCB does not trip again – if it does, you may have a wiring fault. Now you can switch on the appliances or lights one by one, checking that the MCB does not trip. Some miniature circuit breakers might trip when a light bulb blows – this is not uncommon, and usually nothing to be concerned about, modern miniature circuit breakers are more sensitive than older fuses to current surges that can occur briefly as a lamp filament blows. A residual current device, or RCD, is a life-saving device which is designed to prevent you from getting a fatal electric shock if you touch something live, such as a bare wire. It can also provide some protection against electrical fires. RCDs offer a level of personal protection that ordinary fuses and circuit-breakers cannot provide. For example, if you cut through the cable when mowing the lawn and accidentally touch the exposed live wires, or a faulty appliance overheats, causing electric current to flow to earth. The RCD is a sensitive safety device that switches off electricity automatically and quickly if there is a fault. Every year in the UK around 70 people die as a result of electrical accidents at home. A Government report also indicated that, each year, about 4,000 fires caused by electricity in homes might have been prevented if RCD protection had been fitted in the consumer unit. Despite this, more than half of UK homes – that’s 13 million – don’t yet have any, or an adequate level of, such additional protection. Fixed RCDs are installed in the consumer unit (fuse box) and can provide protection to individual or groups of circuits. A fixed RCD provides the highest level of protection as it protects all the wiring and the sockets on a circuit, and any connected appliances. Socket outlet RCDs are special socket-outlets with an RCD built into them which can be used in place of a standard socket-outlet. This type of RCD provides protection only to the person in contact with equipment, including its lead, plugged into the special socket-outlet. Portable RCDs plug into any standard socket-outlet, and an appliance can then be plugged into the RCD. They are useful when neither fixed nor socket-outlet RCDs are available but, as with socket-outlet RCDs, they provide protection only to the person in contact with the equipment, including its lead, plugged into the portable RCD. If you have a consumer unit with a fixed RCD and it keeps tripping, it is likely there is either a fault with an item of equipment connected to the RCD-protected circuit, or there could be a fault with the wiring of the circuit. 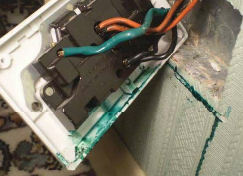 If you cannot identify the faulty appliance, then an electrician can use specialist test equipment to locate the fault. If your property has an old-style fuse box with no RCD protection, replacing it with a modern consumer unit incorporating one or more RCDs is often the most worthwhile safety improvement you can make. You can find more information about RCDs in RCDs Explained on the Electrical Safety First website. If you are not sure if you have any RCD protection, contact Croft Electric for a free check. In the UK, the standard 3-pin mains plug is generally fitted with a 3A or 13A fuse. For appliances up to 700W, you need to use a 3A fuse – for example for a table lamp, television, fridge or freezer. For appliances over 700W, you need to use a 13A fuse – for example for a microwave, kettle, toaster or iron. Most UK equipment is now standardised to one of these two plug fuse ratings, however you may also encounter 5A fuses, especially in older equipment – these fuses are still available to buy. It is important to fit the correct fuse, which is not just there to protect the appliance, but also to protect the cable connecting the appliance to the mains from overheating in case of a fault. You can find more information about mains plugs and fuses in Checking a Plug on the Electrical Safety First website. Older properties may have a fuse box instead of a modern consumer unit, usually with re-wireable fuses. Again, if one of these fuses needs to be replaced, it is important to use the correct size fuse or fuse wire – this protects the wiring in the property from being damaged in the event of an overload. If one of these fuses regularly blows, you may have an item of faulty equipment connected, or you may be overloading the circuit and you risk damaging the cables. Most people have extension leads in their homes, for example 4-way bar adaptors to increase the number of appliances that they can plug into a wall socket. Use the calculator to plug in some typical household appliances to see the effect on the load, and to get useful tips on how to avoid overloading your sockets. The Socket Calculator has been brought to you by Electrical Safety First. See www.electricalsafetyfirst.org.uk for more electrical safety information. Downlighters are one of the most modern and attractive ways to brighten up your home, but choosing the wrong downlighter, incorrectly installing it, or fitting the wrong lamp can pose a serious fire risk. Also, where a downlighter is likely to be covered with thermal insulation in the cavity, it’s important to choose a downlighter that will operate safely under these conditions. • Check for visible markings on downlighters indicating lamp wattage and lamp type. • Check downlighters and their surroundings for signs of overheating such as curled labels and discolouration or scorching. • Ensure that downlighters installed in floor and ceiling cavities have sufficient space around them. • Ensure that downlighters (and associated transformer where fitted) are not in contact with or covered by loft insulation or combustible material, unless they are designed to operate safely in those conditions. • Check that downlighters are not installed near furniture, curtains or similar combustible items. • If dichroic (cool beam) lamps are fitted in downlighters designed for use with aluminium reflector lamps only, replace them with the correct type – look for the symbol indicating no use of ‘cool beam’ lamps. Croft Electric gets regular calls about faulty downlighters, often one is not working at all even after changing the lamp, or only works for a short time then fails again. Often the problem turns out to be that too high a rating lamp has been used, or dichroic lamps have been used in fittings that specify aluminium "heat forward" lamps only. The lamp holder or connecting cable will often be damaged, perhaps giving an intermittent connection that fails as the fitting heats up. Sometimes the internal cable has been previously repaired inside the housing with a "choc block" connector that eventually melts or chars. If the lampholder is damaged, scorched or corroded, do not fit the lamp, and seek advice from a registered electrician. See the Electrical Safety First website for more information. With the latest LED downlighters, heat generation is less of a problem, since these run at much lower power (typically between 4W and 10W). So as well as saving electricity, they are much less of a fire risk compared to the older halogen downlights. It is possible to convert many older halogen downlights to use LED lamps, Croft Electric can advise on this. With flooding often in the news, if you are affected by flooding, take heed of the advice from Electrical Safety First. 1. Do not touch any sources of electricity – such as switches or appliances – when you are standing in flood water. 2. If your electricity supply is not already turned off, contact your supplier for help and advice. 3. Don’t turn your gas and electricity back on until your providers say that it is safe to do so. 4. Do not attempt any electrical repairs or connection of temporary supplies yourself – always use a registered electrician after contacting your supplier. 5. Get an Electrical Installation Condition Report (EICR) done on your home by a registered electrician. This report will check the condition of the electrical wiring in your property. You might also want to ask your registered electrician to have a look at any electrical equipment and appliances that could have been affected by flood water. If you are leaving your house to avoid flood waters, turn off the main switch for the electricity supply before you leave – this will usually be on or near your consumer unit or fuse box – this can help prevent damage to the circuit in your house. Once the waters have drained away, you need to call an electrician to inspect and test the cables that run throughout your house. Cables need time to dry out, and switching back on while everything is damp can cause further damage. For more detailed advice on what to do, you can download the free leaflet from Electrical Safety First: Where to start once the flood water has gone. You can find a number of Electrical Safety Leaflets available for download on the Electrical Safety First website. Contact Croft Electric if you require guidance on any aspect of electrical safety, or for fault-finding and repair.